September 2017, KTUA won the 2017 American Planning Association (APA) California Planning Award of Merit, Transportation Planning Award for the City of Temecula Multi-Use Trails and Bikeways Master Plan Update – Large Jurisdiction. In May, KTUA won the APA California Inland Empire Section, Comprehensive Planning Award – Large Jurisdiction, for the same project. Following its 1989 incorporation, the City of Temecula surveyed its residents and discovered strong support for trails and bikeways as an important quality of life element and that the City needed to develop a community-wide system connecting schools, parks, open space, shopping and employment centers to support both active transportation and recreation. 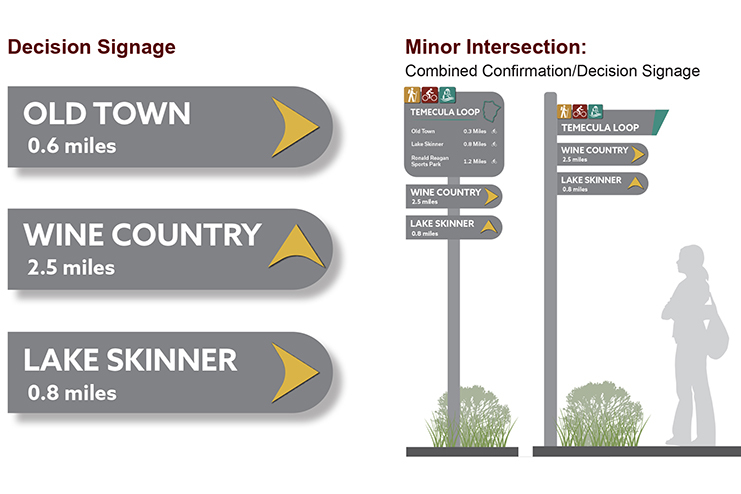 Wayfinding signage concepts employing branding developed for the Temecula Multi-Use Trails and Bikeways Master Plan project planned to be implemented throughout Temecula. Much has changed in the mobility planning world since the City’s original 2002 plan, especially a greater focus on adapting streets to support active transportation, including wider acceptance of innovative on-street bicycle facilities and considering trails as a transportation element. 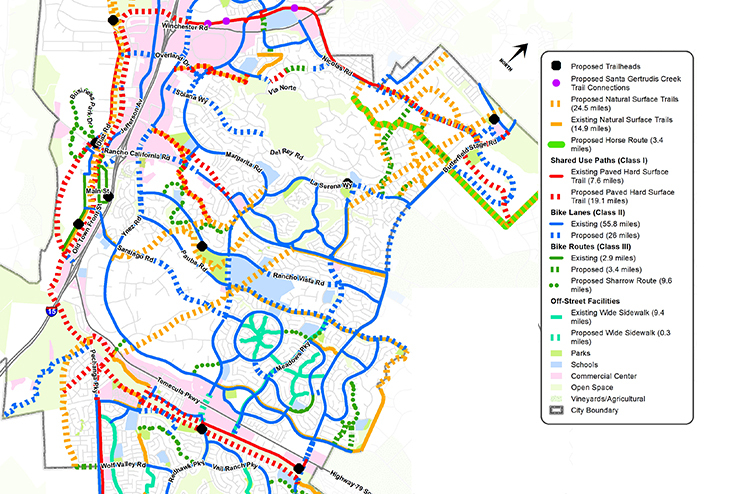 This resulting Multi-Use Trails and Bikeways Master Plan is a comprehensive update that therefore focused on evaluating both previously and newly proposed trails and on-street bicycle facilities using conventional field techniques, geographic information systems (GIS) analysis, and incorporating project public input via community meetings, walking/biking events and additional online surveying. Many new facilities, including two pump tracks and a bike skills park, were included in final recommendations based on strong resident interest evident through workshop input and online surveying. An important change addressed by this plan was greater acceptance of off-street facilities as not just recreational amenities, but integral transportation system components. This updated plan reflects this new mobility environment with up-to-date facility design guidelines and recommendations. These elements reflect an expanding emphasis on accommodating all roadway users, including vulnerable ones, like children traveling to and from school, and the types of facilities required to provide true mobility choices for all. Among the updated planning techniques employed for this project was a bicycle boulevard appraisal employing level of traffic stress (LTS) analysis, a GIS technique that helps to define the likely comfort or discomfort a typical cyclist may feel on a particular roadway. This analysis was verified through extensive field work. 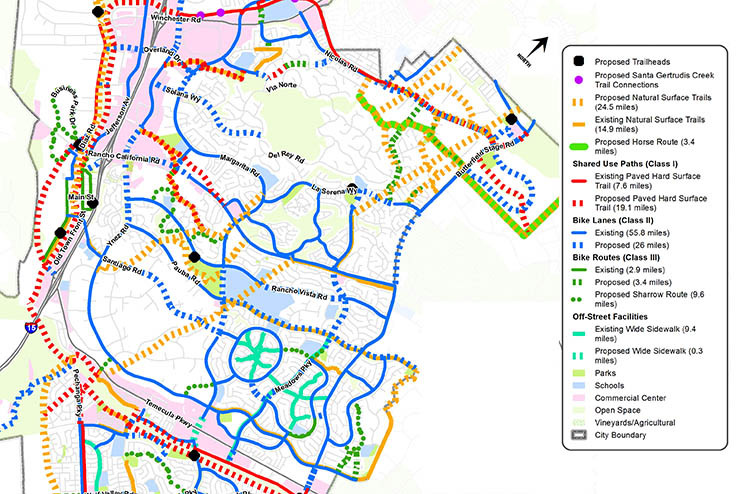 Existing and proposed facilities, from on-street bikeways to natural surface trails. Upon implementation, the result will be an interconnected network designed to encourage more residents to get around via active transportation modes like biking and walking instead of driving, just as Temecula’s citizens’ survey responses had clearly requested before the term “active transportation” had come into wide use.